I’m late in putting this out there, but it’s worth watching. This is a video from a Star Trek convention from 1973: that’s before the motion picture that reignited the franchise. So these are the true believers, those who followed the television series, and perhaps were starting with the short lived animated series. These were the precursors for all the conventions that would come, and the conventions that would become the mega-merchandising and marketing affairs of Comic-Con in San Diego. But what struck me most about this video was not the way people discussed how they related Star Trek to their everyday lives. This is something we find all the time in fandom — and perhaps is a primary reason in why fans, especially scifi/fantasy fans, are marginalized in society and pop culture (until recently, due to how much money Hollywood can make off them). No, what I found amazing was the presence of women at the convention, engaging in cosplaying and discussing the significance of the series in their lives. Growing up in the 1980s, I thought I was abnormal for being a female geek/nerd. I grew up isolated in the country, in the era before the Internet. I remember a love for Star Wars when the first movies were out — I should tell you the story of my Ewok stuffed doll some time, don’t let me forget — and I even dressed up at Princess Leia once for school (1st grade, get that image out of your head). But I don’t remember any of the kids I went to school with sharing my love. There were only 17 kids in my class, and by the time I got to a bigger school in 6th grade, Star Wars had receded in my mind, and I didn’t really find anyone to talk to about my other loves of The Turtles, The Ghostbusters or The Thundercats outside of my two younger brothers. And the idea of a girl to talk to about any of this? In elementary school, there were only five other girls in my class. My best friend was the girl who lived closest to me, and we definitely did not share that interest. Even when I did find my re-love of all things science fiction in high school, it was boys that I hung out with, not girls (although I did try D&D once with some girls, and that was interesting). Whenever I saw nerds/geeks in the pop culture, they were boys. Maybe I just had my head in the sand. Maybe I just wanted to think I was special for being a female nerd/geek, so I could curry favors from the boys around me. But I just did not think women were that prevalent in fandom, and for that long. Of course, maybe this film is showing the women because they were outliers in the sampling: that they were as uncommon as I thought they would be, and thus were special people to interview. What I do know is — I’m a fan of fan studies, because as a geek I find all of these questions interesting and fun to investigate. I remember quite well going to Star Trek cons in the late 80s and early 90s, and noting that there were a lot of female fans at the show. I think they’re less obvious about being fans outside of the conventions. I remember going to a Trek show around 1990 and getting a T-shirt of some kind. And when I wore it to class the following week (I was in college) I was quite surprised that a couple of women I thought unlikely to be fans asked if I got it at the convention and said they had been interested in going but didn’t have any friends to go with. Purely anecdotal, I know, but interesting. I think there may also have been something unique about Star Trek that elicited more fandom among women, especially as our understanding of the fan activity “slash” goes back to the Kirk/Spock pairings written and drawn by fans going back to the 1970s. Perhaps it was the discourse of gender equality that the show advocated (which would be greatly expanded upon in subsequent movies and series). 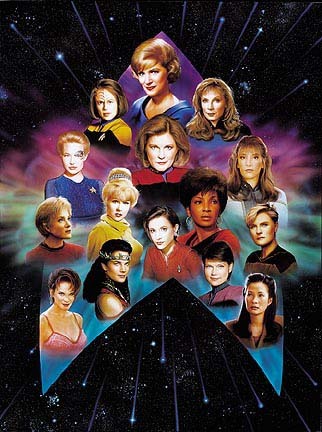 Considering the range of science fiction and fantasy titles that preceded, and even occurred concurrently, with Roddenberry’s series, the presence of women in Star Trek must have been seen as a great outlet for identification for female audience members, encouraging affection and spreading fandom.